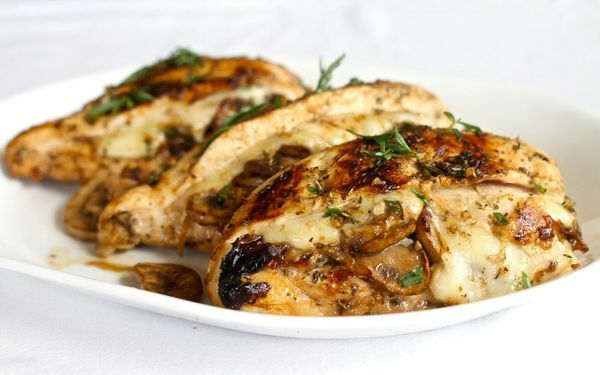 Chicken Breasts — 6 PCs. 1. Mix all the ingredients for the marinade, stir the mass until smooth. 2. Place the chicken in the package with the lock, add the marinade (but save ½ Cup). Soak for 20 minutes while you prepare the mushrooms. Fry in a pan onion and garlic in olive oil. Put the mushrooms, season with salt and pepper. Simmer until cooked mushrooms. 3. Cut breast lengthwise, but not cut completely, put mushrooms and a piece of cheese, sprinkle tarragon. Secure breast toothpick to the filling does not fall out. 4. Fry Breasts on both sides for 2 minutes in a pan with olive oil and then put them in a dish and cover with foil. Bake in a preheated 190°C oven for about 10 minutes (until tender).